With the demand for power shooting up drastically, the state is reeling under severe power crisis. The soaring mercury, heat wave and unscheduled power cuts in almost all parts of Punjab has left the people high and dry. The Excise and Taxation Department has banned nearly 80 rice mills in Muktsar district from interstate trading after declaring these as defaulters for not paying the infrastructure development (ID) cess for the past three years. While reacting differently to the Budget proposals keeping in mind their political agenda, leaders of various parties across the board are pleased that the common man has been spared of fresh taxes. The Punjab BJP today made it clear in the assembly that it was against bestowing honour on former Chief Minister Beant Singh’s assassin Balwant Singh Rajoana, saying it would not compromise on terrorism. Drug abuse in Punjab dominated Question Hour with Chief Minister Parkash Singh Badal expressing helplessness in curtailing the flow of drugs into Punjab from its porous border with Rajasthan. State BJP general secretary Manjit Singh Rai today condemned the demand for a Sikh Mayor in Amritsar. In a press statement, he said such demands were aimed at creating a rift between the Hindu and Sikh communities. Most localities in the city and Cantonment areas have been facing unscheduled power cuts for at least two to three hours a day ever since the municipal elections held recently. Residents say there is no fix time for power cuts. Without power, water supply is also hit, which has affected the normal life. Despite repeated criticism from doctors, the Punjab Health and Family Welfare Department is yet to take a decision regarding rationalisation of benchmarks for OPDs and surgeries, allegedly forcing health officials to supply fake data or carry out unnecessary surgeries to achieve their targets. Many doctors say that due to these benchmarks, they were forced to work under pressure. Eight youths have reportedly been missing from an unauthorised drug de-addiction centre at Charik village in Moga district since last night. Villagers blocked the Bathinda-Ferozepur railway line for over three hours after a woman was killed at an unmanned railway crossing near Akalia-Kalan village on the Bathinda-Jaitu road. In a significant judgment, the Punjab and Haryana High Court has held that a case can be transferred by a Sessions Judge in the same sessions division, even after the commencement of the trial. Two days after a bloody clash between farmers and the police at Balberha and Charason villages, the district police has booked over 50 persons, including a few women, on the charges of attempt to murder, damaging public property and attacking policemen on duty. While the police is yet to make any arrest, the situation in the villages is tense but under control. In a shocking development in a kidnapping incident, 11-year-old Sushant Arora alias Karan, was killed by his abductors. Gurmej Singh, a former sarpanch of Chakmadike village in Ferozepur, and Sulakhan Singh of Fattuwala village in Jalalabad were nabbed today by the counter-intelligence wing of the Punjab Police with heroin worth nearly Rs 43 crore. While the industry is fuming over the weekly offs imposed by the Punjab State Power Corporation Limited (PSPCL), farmers are protesting that they are not getting eight-hour power supply for paddy transplantation. Domestic power consumers in all areas are having sleepless nights on account of unscheduled and long power cuts. The demand for power demand this month reached a peak of 8,778 MW, up by 312 MW as compared to last year. 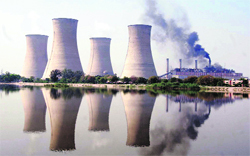 Though the power regulatory measures (weekly offs) on the industry during summer months is a routine affair, long power cuts in the domestic sector, frequent breakdowns and technical snags in the transmission network have exposed the ill preparedness of the power corporation to deal with the high demand during the summer season. Reports from all parts of the state indicate that the problem is acute. In districts like Ludhiana, both industrial and domestic power consumers are facing a tough time. Farmers in Patiala and Sangrur are complaining of inadequate power supply for paddy sowing. Power scenario in the domestic sector is worrying with cities like Amritsar, Jalandhar, Patiala, Ludhiana, Sangrur, Mohali and Ropar facing power cuts varying from three to four hours. "It is surprising that the top brass of the PSPCL had claimed that there will be no power cuts this summer, but the ground reality is completely the opposite," said a majority of the residents. People say as the annual maintenance work of the transmission systems is undertaken well in advance in winter, there is a need to probe frequent technical snags in the network. A majority of the farmers are unhappy with the PSPCL for its failure to provide eight-hour power supply as was assured to them by the government. Farmers in Patran, Samana, Sangrur and Patiala said if they did not get proper water supply, paddy sowing was bound to be adversely affected. "We request the authorities to make sure that the farmers get the promised quota of power," they said. State unit president of the Indian Farmers Association Satnam Singh Behru said farmers were getting power for only three to four hours. Besides agricultural pumpset (AP) consumers, domestic consumers in villages are also bearing the brunt. "We are struggling on account of erratic power, particularly during the evening hours. Three to four hour cuts during night have become routine ever since municipal elections are over," said Sarita, a resident of Ramnagar village in Patiala. At present, the PSPCL has imposed one-day weekly off on the general industrial consumers (except consumers falling under Ludhiana East and West Circles), two-day weekly off on all general consumers falling under Ludhiana East and West Circle and on induction/arc furnace and rolling mills. Apex Chamber of Commerce and Industry (Punjab) president PD Sharma said besides weekly offs, the power corporation imposed unscheduled cuts for one to two hours daily. Industrialists point out that without adequate power, the industry can't utilise its captive power through generator sets on account of heavy VAT (8.8 per cent) on diesel. Under such circumstances, per unit cost of power through generator sets is more than Rs 12, which is too high. Industrialists said the weekly off also disturbed the schedule of the labour. President of the Federation of Punjab Small Industries Association Badish Jindal said the weekly offs had reduced the total production by 33 per cent. "Besides the industry, the government also suffers loss as less production would mean less VAT," he claimed. Jindal said if the government failed to take necessary steps to redress the problems being faced by them, industrial units would start migrating to other states. "Already 600 cycle and fastener manufacturing units are contemplating to shift as they have got an offer from Hyderabad of uninterrupted power at the rate of Rs 4 per unit," he said. Recently, orders were issued by the Punjab State Electricity Regulatory Commission (PSERC) that the industry will have to pay the same amount of transmission and wheeling charges for procuring power through open access (OA), as is being paid by other categories of power consumers. This has made the OA route unfavourable for the industry. "Such adverse policies of the government have virtually crippled the state industry," said industrialists. KD Chaudhri, CMD, PSPCL, said: "This time, the peak demand witnessed a huge jump as compared to previous years. The load has suddenly shot up by 15 to 20 per cent and in the wake of immense load on the Northern grid, its frequency is low due to which we are not able to overdraw much power". Chaudhri confirmed that cuts were being imposed but claimed that farmers were being given enough power supply. He said: "Out of 573 substations, 122 are getting six-hour power supply while the rest are getting supply for eight hours". On the issue of weekly offs on industry, Chaudhri said: "In a week, the industrial units remain closed for one day and keeping that in mind, the schedule for two weekly offs has been prepared, which means practically there is one weekly off". Arun Verma, Director (Distribution), PSPCL, said this year, there had been an unprecedented increase in power load, which had hit the supply schedule as additional power was purchased taking into account the demand recorded in the past three years. KD Chaudhri, CMD, PSPCL, said there was no need to panic as the situation would improve soon. “The peak demand witnessed a huge rise this year. The load has shot up by 15 to 20 per cent and in the wake of immense load on the Northern grid, its frequency is low due to which we are not able to overdraw much power”. Taking a strict action on the defaulters, department officials has even blocked their TIN numbers to ensure that they cannot even make any transaction regarding import or export of rice. Officials of the Excise and Taxation Department said the dues were in crores as the cess is applicable at 3 per cent on the total value of rice purchased from other states. “After we cracked down on the defaulters, some of them have paid the cess amounting to nearly Rs 20 lakh. But their TIN numbers are still blocked and they cannot trade with other states until they clear all their dues,” said BS Kahlon, Assistant Excise and Taxation Commissioner (AETC), Muktsar. “Before trading with other states, they will have to clear the dues and get a no-dues certificate,” Kahlon said. “There should be some middle path so that the millers can do business and earn some profit,” added Binta. Every party agrees that Punjab must generate revenue and mop up additional resources. But none is willing to see their vote bank burdened financially. Understandably, the Akali’s have appreciated the Budget, but several senior leaders are worried at the state’s declining fiscal health. Not wanting to displease their rural vote bank, they want that the additional resources should be mopped up from urban areas. While senior BJP leaders officially maintain that the Budget is people-friendly and Finance Minister Parminder Singh Dhindsa has done a fine job, in private they are cautious. A senior BJP leader said Dhindsa had indicated that taxes would be imposed to get central grants under Jawaharlal Nehru Urban Renewal Mission (JNURM). The party sees this as a red flag. “The BJP agrees that more funds should be generated. But we must be told from where this money will come. The SAD must make a proposal in this regard and we will discuss it. We will support the proposal as long as it does not burden the middle class. Imposing water and sewerage tax while providing free power to the agriculture sector won’t do,”the leader said. Congress Legislature Party Leader Sunil Jakhar says the Budget is nothing but a statement of accounts that neither provides a direction or a vision for Punjab’s development. “The Budget continues to borrow without looking at the consequences of such irrational loans for the state’s growth,” he maintains. Jakhar says the Rs 250 crore austerity measures is a joke when the revenue deficit is over Rs 3,123 crore and the fiscal deficit over Rs 8,900 crore. “The government is going to borrow over Rs 12,000 crore to meet routine expenses. What kind of financial prudence is this when the government itself admits that the state is in a financial mess. A mere charted accountant’s statement does not help in running the state,” Jakhar says. Pradesh Congress president Capt Amarinder Singh says the government has deliberately not imposed new taxes but the people can expect surprises such as hefty water and electricity bills. Akali leaders admit in private that the rising deficit is alarming and more money could have been collected. But they are happy that poll tion promises have been met. Speaking on behalf of the BJP after a demand from Congress Legislature Party Leader Sunil Jakhar that the party should make its stand clear on the floor of the House, Health Minister Madan Mohan Mittal said: “We do not regard any murderer as a martyr”. Naming Congress legislators Gurkirat Singh Kotli, Rakesh Pandey and Tarlochan Sondh, the BJP leader said “I am with them” on the issue. Mittal explained his own role during the period of militancy, saying he had led the fight against terrorism from the front, even as he accused the Congress of being responsible for the same. He even claimed that “Rao wanted us to support the Akali faction led by Capt Amarinder Singh. He wanted to make Amarinder CM as he felt the people of Punjab would not accept a Congress government”. Talking to TNS, Mittal said the memorial issue was likely to be closed with the Chief Minister making it clear that it would be a gurdwara without any photographs. “We had lodged a protest with the CM and told him categorically that raising a memorial to those killed in Operation Bluestar was not a good development”. He said with today’s clarification, the controversy on the memorial was over as the hardliners had given a different connotation to the proposed memorial. Mittal also claimed that there were hardliners within the SAD who wanted to create trouble for Badal. “They want to put Badal in an awkward position and not us”, he said, adding attempts were being made to embroil Badal in a controversy by joining religion with politics. The BJP leader also claimed that the SAD had little role in the decision to honour Rajoana, adding the Damdami Taksal and a few other hardline groups were behind the move. Mittal, however, made it clear that the BJP was opposed to any move to honour Rajoana. “We are clear that a murderer is a murderer and can never be turned into a martyr”, he added. Even as the House was told about various steps taken to combat the menace, the Chief Minister sought Congress’ help to bring the issue to the notice of the Congress government in the neighbouring state. It all started with Congress MLA Charanjit Singh Channi asking Health Minister Madan Mohan Mittal about measures being taken to curb drug abuse. Though, the minister had a prepared answer, Badal got up to say that poppy husk was sold like a grocery item in neighbouring Rajasthan and invariably found its way into Punjab. He asked CLP Leader Sunil Jakhar to accompany a government delegation to Rajasthan to bring the matter to the notice of the government there. Mittal said the state had set up seven de-addiction centres in six districts, besides a 20-bed centre at Talwandi Sabo. Another 50-bed centre was being run at Amritsar. The minister said more de-addiction centres had been planned. He said the government wanted to catch the big fish behind the illicit trade and the government was offering huge incentives for information leading to the arrest of members of the drug mafia. Also, health officials were conducting raids on suspected hideouts. Rai said undoubtedly Amritsar was sacred for the Sikhs. But this did not mean that political posts should go to the Sikhs alone. The demand was unjustified as the entire Punjab was the land of the Gurus. “If things are to be decided on this principle, then the Prime Minister of a Hindu-dominated country would never be a Sikh. Neither would a Muslim be the country’s President. Neither Gaini Zail Singh would have been President of India, nor General JJ Singh the Army Chief,” Rai said. “Punjab has already witnessed terrorism and issuing such statements would only mean disturbing the peace and tranquility of Punjab.” he added. Ludhiana: With the 100 MVA transformer at 220 KV Ferozepur Road substation still being non-functional, power situation has worsened in the city. Residents are forced to cope with the sweltering heat. Unscheduled power cuts being imposed for six to eight hours every day. Inverters are no longer a viable option as power is not available for sufficient period to charge the batteries. "With no schedule, it has become difficult to perform even daily chores because water supply is also badly hit," complained residents of Haibaowal and Civil Lines. Amritsar: The demand for power has shot up by over 20 per cent in the last 20 days in Amritsar. Balbir Singh, Superintending Engineer, said the entire state had been under severe power crisis because of a fall in power generation due to less rain. The situation might remain the same for the next few days, he added. The residents of Majitha Road, Taylor Road, Batala raod, Shastri Nagar and Shakti Nagar areas have been forced to cope with long and unscheduled power cuts. The department had fixed the number of patients that should be examined and treated by each doctor throughout the state per month. "The first benchmark is for the OPD where every doctor needs to see a particular number of patients. A doctor of medicine has to examine 60 patients, paediatrician 50 patients and a surgeon has to carry out 15 major and 40 minor surgeries,” said a doctor. “The benchmark for every disease differs, but still doctors have to meet a certain fixed target every month. Also, there is a fixed number of patients that have to be admitted in health centres and surgeries to be carried out by doctors,” he added. Patiala Civil Surgeon Dr Virinder Singh Mohi said the benchmarks help in fixing accountability. “We consider all factors before fixing benchmarks, including weather and other area constraints. Therefore, there is no question of putting unnecessary pressure on doctors,” he added. The Station House Officer of the Charik police station, SI Mohan Dass, said he had received a complaint from the worried family members of one of the patients undergoing treatment at the de-addiction centre. “I have summoned the owners of the centre for a formal inquiry. Legal action will be taken if they fail to produce the missing youth before the police”, he said. It is reliably learnt that two persons have been illegally running the centre for the past couple of years. Following a dispute, one of the partners had ‘kidnapped’ at least eight addicts, sources said. A senior health official said the centre did not have the mandatory permission from the Health Department to treat addicts. Surjit Singh Grewal, SSP, said he had asked the SHO to trace the missing youths and initiate legal action against those running the centre illegally. District Magistrate Arshdeep Singh Thind did not respond to phone calls. The incident took place at 11 am when the Jind-Ferozepur Express hit a Maruti Zen car at around 11 am. Witnesses said the car abruptly stopped on the rail tracks. Dharam Singh and his nephew Devinder began to push the car, unmindful of the approaching train. The train dragged the car for more than half a kilometre. Dharam Singh’s sister-in-law Karamjit Kaur, who was seated in the car when the accident took place, died on the spot. Both Dharam Singh and Devinder were hospitalised with serious injuries. A large number of villagers gathered at the accident site and blocked the track to protest against the unmanned crossing that has taken several lives. They said they had written to the railway authorities several times in this regard but to no avail. They said recently a gurdwara priest from a nearby village had been killed at the crossing. A local resident said since a busy road ran parallel to the tracks, the sound of an approaching train was often drowned in the traffic din. Joint Secretary of the All-India Youth Akali Dal Swaran Akalia blamed the railway authorities for negligence. Senior railway officials, including Assistant Divisional Engineer Ashwini Kumar, visited the accident site and assured of remedial measures. The judgment is significant as the general perception, even among some judges, was that the trial could be transferred only by the high court after its commencement. The ruling came on a petition filed by Pritam Singh against Manmohan Singh. In his petition placed before Justice Ranjit Singh, Pritam Singh had sought the transfer of a case pending before Hoshiarpur Additional Sessions Judge Manjinder Singh to any other court. He had initially filed an application before Hoshiarpur Sessions Judge for transfer of the case to any other court at Hoshiarpur. Accepting the plea, the Sessions Judge had transferred the case to the court of Hoshiarpur Additional Sessions Judge JS Bhinder for trial and disposal. The parties were directed to appear before him on February 21. The judge, vide order dated March 26, sent the case back to Hoshiarpur Sessions Judge, stating that the matter was seemingly transferred inadvertently. “Apparently, the court was of the view that after commencement of the trial the case could not have been transferred and this could only be done by the high court. The Sessions Judge, Hoshiarpur, thereafter observed that the case was transferred inadvertently to the court of JS Bhinder, Justice Ranjit Singh observed. In his detailed order, Justice Ranjit Singh asserted that both the Sessions Judge and the Additional Sessions Judge apparently had not properly considered the “legal position as would emerge from Sections 408 and 409 of the CrPC”. Referring to another case decided by the high court, Justice Ranjit Singh added that the sessions court, exercising judicial power under Section 408 of the CrPC, can transfer cases in the same session division even after the commencement of the trial. Police sources confirmed that more than the farmers, some vested interests had played politics and ensured that there was violence at the site. “Some of them fired gunshots at the policemen and when the police resorted to cane charge, they fled from the scene, leaving innocent farmers to face the wrath”, they said. The police and the farmers had a clash following the administration’s attempt to get shamlat land vacated in Balberha and Charason villages on Tuesday. As many as 17 persons, including eight policemen and nine farmers, were injured in the clash. Meanwhile, the farmer unions claimed the administration has given them time until June 25, when the affected farmers and Patiala DC will hold a meeting for an amicable solution. Earlier in the day, the police conducted raids to recover the weapons used at the crime scene to fire at the police party. However, the police was unable to recover the weapons used in the crime. “We have not arrested the accused as many of them have also sustained minor injuries,” said Patiala SSP Gurpreet Singh Gill. “We will conduct further investigations to ascertain the role of certain individuals who fired at the policemen but had nothing to do with the agitation”, he added. On Tuesday, officials from the Rural Development and Panchayat Department, escorted by a police team, reached Balberha and Charason villages to claim possession of over 100 acres of agricultural land being tilled by the local farmers for the past many years, following a court order. As senior rural development and panchayat officers accompanied by the police teams reached the village to vacate the agricultural land, farmers armed with sticks and stones resisted the move to get the land vacated. The police has arrested five persons in the case while the mastermind behind the incident, who happens to be an immediate neighbour of the deceased, is still at large. Adding salt to the injury, the body of the deceased, which was recovered from UBDC canal from Khalra (Tarn Taran), was cremated by the police as unclaimed after a post-mortem examination. Sushant, who belonged to a middle-class family of Telian Wali gali in the walled city, had gone to play cricket on Tuesday but did not return. The family came to know about his abduction after his father, Sunil Arora, received threatening calls from the accused on the same evening. However, they informed the police on the next day following which a case was registered. Police Commissioner RP Mittal, while briefing the media, said the boy was strangled to death by the accused on the day of kidnapping. “During interrogation the accused has admitted that extorting money was the motive behind the incident. After technical inputs and call details of the kidnappers, the police yesterday zeroed in on his neighbourer Prince and his accomplices,” said Mittal. Those arrested include Harpreet Singh of Anngarh, Gagandeep Singh of Bhagtanwala, Sukhchain Singh of Ludhiana, Kulwinder Singh of Dhapai and his sister Sarabjit Kaur of Guru Nanak Pura. All the accused are close relatives of Prince, the mastermind, who has been absconding till now. Prince had abducted the boy after luring him with a cold drink laced with some intoxicants. Later, they also injected drugs to make him unconscious. But when the boy started getting consciousness, they strangled him to death and threw his body in the UBDC canal near Bohru village on Jhabal road. The decomposed body of the boy recovered from Rajoke drain (UBDC canal) by Khalra police yesterday. “From circumstantial evidence provided by the kidnappers and the only cloth on the body of the deceased, we came to the conclusion that it was of Sushant. We will seek the post-mortem report besides conducting DNA test for further investigation,” he said. He said raids were being conducted to nab Prince. Sunil Arora, father of the victim, received a ransom call on Saturday last for Rs 1 crore for his release. When the family expressed its inability to pay such a huge amount as ransom, they slashed the amount and demanded Rs 50 lakh. They gave him a week’s time and asked them to paste the poster of his missing son when they arranged the money. Meanwhile, a pall of gloom descended on Gate Hakima where people gathered to console the parents and other family members of the deceased. 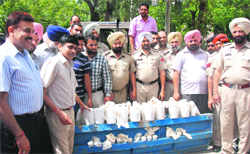 The AIG, Counter-Intelligence, Ferozepur, Ajay Maluja, said on a tipoff, a team of six officers, including inspectors Ranjit Singh and Gurjeet Singh Romana and SIs Piara Singh, Tarlochan Singh, Balvir Singh, Joginder Singh and Rashpal Singh, intercepted a tractor near Shikargah village in Jalalabad. The team recovered 18.6 gm of heroin kept in an iron pipe. The accused were booked under Sections 21, 25 and 29 of the NDPS Act. He said during preliminary questioning, the accused had confessed to have obtained the heroin from their accomplices in Pakistan. The police recovered two Pakistani mobile SIMs from their possession. during the night and inform Gurmej about it on the phone. Gurmej would then hide the contraband in his agricultural implements and dodge BSF officials at the check post.